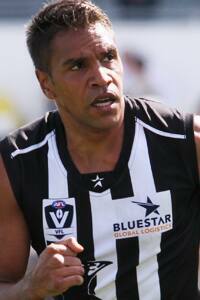 Andrew Krakouer had 36 possessions in Collingwood's loss to Frankston in the VFL on Saturday. Photo: Shane Barrie. As his senior teammates got to work against Richmond at the MCG, small forward Andrew Krakouer was busy lighting up Victoria Park with 36 possessions Saturday's VFL loss to Frankston. The Magpies trailed by as much as 39 points at one stage during the second quarter before rallying and sticking with the rejuvenated Dolphins for the remainder of the day. Defensive Development Coach Mitch Hahn praised Krakouer for his work rate. The 30-year-old spent most of the day on the ball and ended the match Collingwood's best player. "Krak worked hard all day," Hahn told collingwoodfc.com.au. "He played through the midfield and really worked hard and gave us some drive through the middle of the ground." Krakouer's performance was the story of the match, but he received good support from the likes of Ben Kennedy (30 possessions) and Marley Williams (23 possessions). Alan Didak played his best match since returning from a hamstring injury, kicking three goals and being named in the best. "Dids copped a whack to his knee early in the game and did really well to battle through the game," said Hahn. "He ended up playing deep forward and was a pretty dangerous target. "I think he ended up with three goals as a forward but obviously wasn't able to impact the game as much as what we'd liked on the wing. "He certainly gave us a real contest up forward and looked dangerous up there." Ex-Frankston midfielder Kyle Martin continued to make his presence felt on the scoreboard, kicking a season-high four goals (only a fortnight after scoring three against North Ballarat). Lethagic in the first half of the match, Collingwood outscored Frankston in the second half but weren't able to make a sizeable enough indent on the scoreboard. "I'm not 100 per cent sure," said Hahn when asked why the team was slow out of the blocks. "I suppose last week was a high intensity game (when the team lost to Werribee by eight points) and it took a fair bit out of our younger players and it was always going to be a challenge to back it up."